Both of our obstetricians have 3D/4D ultrasound machines capable of producing outstanding images of your growing baby. Ultrasound scans are usually done at every visit at no extra charge. 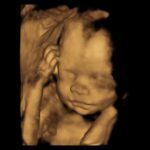 We do still refer you to a specialist ultrasound practice for your nuchal translucency scan at approximately 12 weeks and your morphology scan at approximately 18 weeks. See our gallery of ultrasound images for more examples. On occasion they will also take leave to attend conferences or to enjoy a holiday. If you need to contact your doctor after hours, please page them. If they are not currently on call, the paging company will inform you how to contact the on-call doctor. You may also call The Wesley Hospital Labour Ward on 3232 7221 for obstetric issues or The Wesley Emergency Centre on 3232 7333 for gynaecology issues. We are not a bulk-billing practice, so you will have out-of-pocket expenses if you see us. Please contact our practice staff for information about our fees. Payment is required at the time of your consultation. We prefer payment by EFTPOS or major credit cards. Obstetrics is by nature an unpredictable profession. Being involved in our patients’ deliveries is important to us. As a result, appointments might sometimes need to be delayed or rescheduled. Feel free to contact us before leaving to travel to your appointment to check if we are running on time. We will do our best to keep you updated if there is a possibility your appointment might be delayed.